Learn about Fayetteville, West Virginia by reading Fayetteville, W.V.—A Big Leap Into Adventure by Charlie Spence, Aviation Writer. It features a mini, but thorough tour of the destination, plus all you'll need to know to plan your trip including getting there, objective information on places to stay and eat, and things to do. At the end of the article, we've provided a summary of the contact information for your easy reference. Enjoy! Once a year, nearly 200,000 people converge on an area just outside Fayetteville, West Virginia, for the largest one-day extreme sports gathering in the world. While this event attracts world-wide attention, Fayetteville and the surrounding areas are interesting and exciting places to be in on any of the remaining 364 days. That sporting event is known as Bridge Day. It is the time when adventurous and courageous men and women parachute off the New River Gorge Bridge, the second tallest bridge in the United States and the second longest single span bridge in the world. The bridge was opened to traffic in 1977 and the main span of the bridge is just a little more than 3,000 feet across and 876 feet above the rapids of the New River. Pedestrians are not permitted on the bridge, except on Bridge Day. The bridge cut the time of going from one side of the gorge to the other from about 45 minutes of dangerous driving over winding roads, to just a little more than a minute. The first Bridge Day was in November 1980, when two parachutists jumped from a plane onto the bridge and five others jumped from the bridge into the gorge. Since then, each year has seen more and more jumpers, more and more visitors, and greater attention from the world for this event. By 1986, four hundred jumpers had taken the plunge. Then came the bungee jumpers. Two hundred sixty five people rappelled from the bridge in the 2000. The rapids of the New River offer some of the adventures you can experience when you visit Fayetteville. Whitewater rafting, kayaking, and fishing are excellent along the river, which for miles north and south of the bridge is protected by the National Park Service. 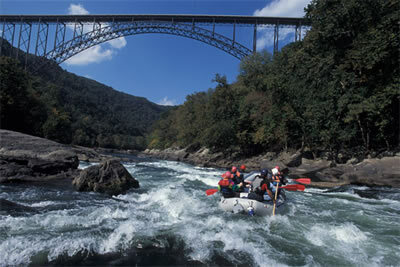 You will find more than 15 rafting companies along the New River. Its northern neighbor, the Gauley River, offers a recreation area providing boating opportunities to soak up much of the scenic beauty. Although the views are spectacular almost any time of the year, the fall time period around Bridge Day offers majestic beauty. Rafting trips are available in all but the winter months. Classifications of rafting range from Class II to Class V. Spring is the time for experienced rafters, but if you are new to rafting, an early summer journey is suggested. Whatever your choice, you will find the locals more than willing to help and stores ready to provide the supplies you need. Rafting along the river gives you excellent views of the miles of sandstone rock that is excellent for climbing. Climbing up the sheer cliffs will give you stunning views of the area ranging from dramatic waterfalls to a different perspective of the New River Bridge. The numerous businesses in the area provide guides, instructors, and safety sessions geared toward the level of experience – from novice to veteran. The climbing season generally runs from April through October. So you’re not the adventurous type looking for the exhilarating actions of riding the rapids or clinging to the cliffs. There is so much more to help you relax. Locals can show you some of the quiet spots along the river to enjoy hours of fly fishing, or take a quiet hike on any one of the more than 1,600 trails. To enjoy the beauty of the season without hiking along the trails, make it a pleasing journey on horseback, or go mountain biking on a guided tour through the scenic gorge. See some of the historic coal and timber camps. There are bike rentals and tours for all levels of peddlers. Of course, there is always golfing to either relax you or raise your temper, whichever might be your level of play. 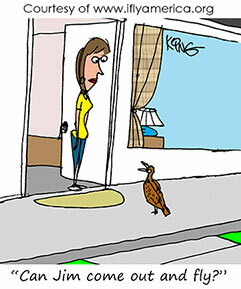 Depending on the time of year you visit, it can be an ideal place for bird watching. Each spring, hundreds of species of birds make this area their temporary resting spot during their migration south. Many of these beauties are rare in some states. You won’t want to spend all your time amid the outdoor splendor. Take some time to visit the downtown area where you will find homey shops, galleries, and distinctive mountain items. You’ll find works of local artists, sculptures, jewelry, and collectables to take back home for regular reminders of your visit. Drop into places like Water Stone Outdoors for outdoor equipment, Gallery-Studio B for pottery, jewelry, and paintings, or find your souvenirs and gifts at Wisteria Gifts. The city dates back to 1837, and has a rich history. It was originally named Valdalia for the revolutionary war hero and local farmer, Abraham Vandal. The name was changed in 1883 to honor another war hero, the Marquis de Lafayette. During the Civil War the town changed hands several times and much of it was destroyed. To soak up its heritage, take one of the guided tours through the downtown area. Fayetteville is off the beaten track, but once you see its rustic beauty you will think of it as the gateway to the New River Gorge-ous. The nearest public use airport is Summersville, which is about 24 miles away. (There is an airport at Fayetteville, but it is private and needs advance permission to land.) Summersville Airport (SLX) has a single runway—4/22—asphalt, 3015 x 50. There is no landing fee but there is a tie down fee. Field elevation is 1820 MSL with traffic pattern 2820. Navaid approach is VOR. Rental cars are available. The Charleston Airport (CRW) is about 60 miles northwest of Fayetteville. It has two runways; ILS, VOR, and GPS approaches. There are landing, ramp, parking, and hangar fees. Bed and Breakfasts, the Quality Inn and the Whitewater Inn are available in Fayetteville. Other hotels are available in surrounding communities. Facilities are crowded around Bridge Day, so it is wise to make your reservations in advance. Make your reservations before you go through IFA’s Online Travel Booking Service at www.iflyamerica.org/travelservices/travelservices.asp. Significant hotel and car rental discounts may apply. Several restaurants are in Fayetteville, providing a fine taste of mountain cooking. Try the ribs at Dirty Ernies Rib Pit, the Cajun food at Gumbos, or hometown cooking at Cowboys.